Can you make pizza on the Big Green Egg? Yes! You make pizza on the Big Green Egg the same as you would in the oven. 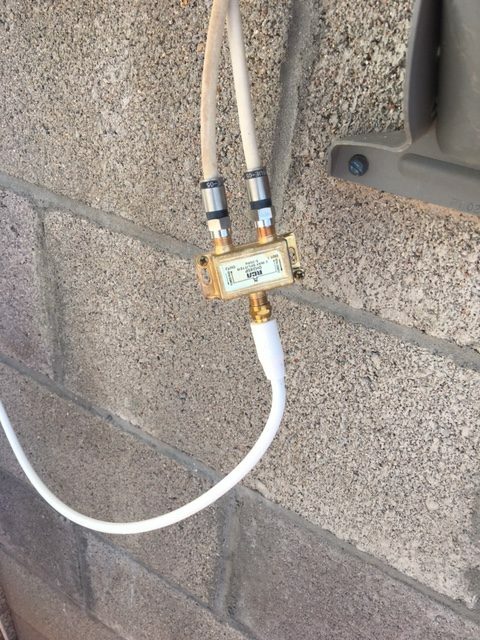 The only difference is you’re cooking over a flame on the grill. Cooking your pizza can be a great experience. 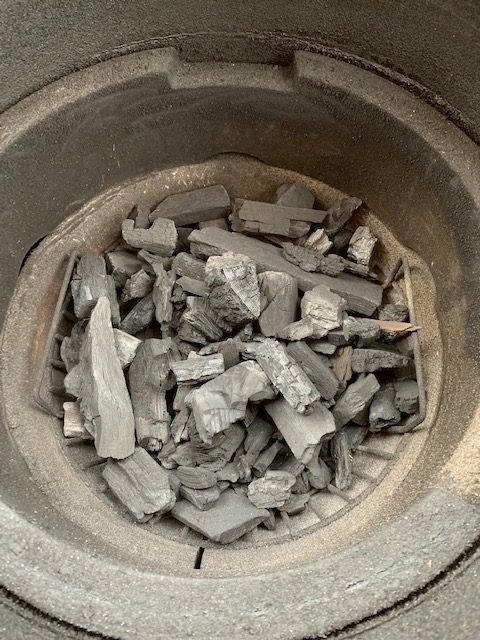 Your homemade pizza will taste even better with the smokey flavor the lump charcoal provides. You’ll think your Big Green Egg is a very expensive Italian wood-fired pizza oven! 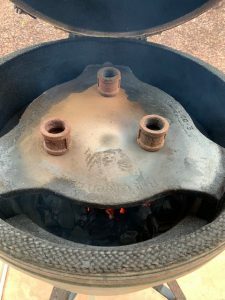 You’ll learn the techniques to cooking pizza on your Big Green Egg, let’s get cooking! The first step is to create your pizza dough. If you don’t want to make your dough, there are prepared options like Boboli. You can also call your local pizza restaurant because I’ll bet you they will sell you pizza dough. 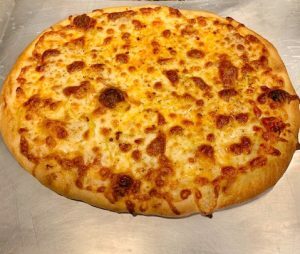 Making your pizza dough for the Big Green Egg is part of the fun, here’s my go-to recipe from Giada de Laurentiis. You can Google other pizza dough recipes. The key to making your pizza dough is using natural ingredients and allowing time for the dough to rise. When I’m setting up to cook pizza, I like to fill the firebox with charcoal. It is always easier to bring up the temperature of the grill than it is to add more charcoal because you didn’t start with enough. Start your charcoal and get to your desired temperature. Cooking pizza requires cooking indirect. 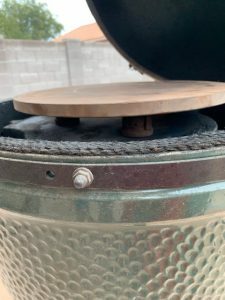 Should the Big Green Egg plate setter legs up or down? Put the plate setter legs down. You will need to keep the pizza stone off the plate setter. 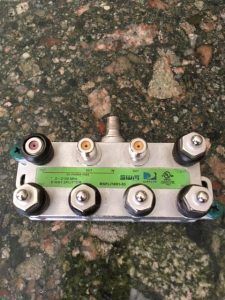 If you put the stone directly on the plate setter, excessive heat can cause the stone to crack and break. I bought three metal water pipe fittings that were all the same size and used them to put the pizza stone on. 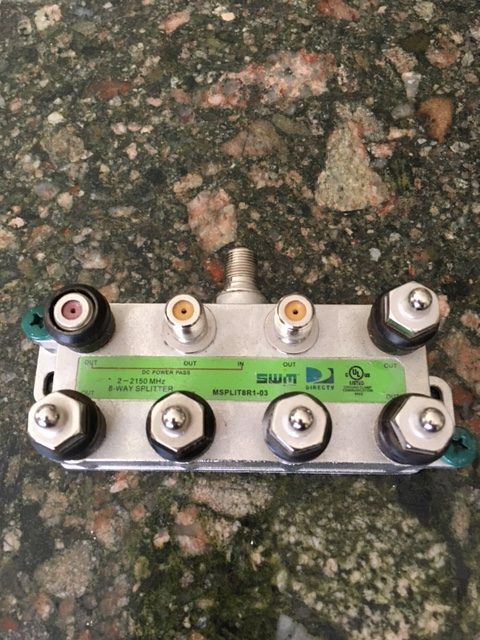 You’ll get 2 inches of clearance for air to flow between the plate setter and pizza stone. I have never broken a pizza stone. 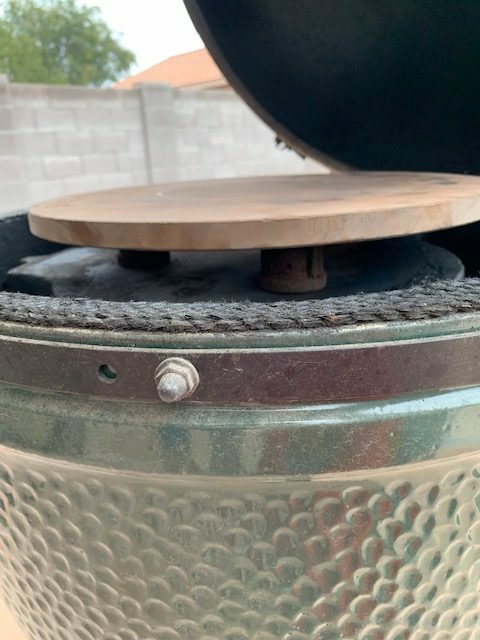 You can also use your grill grate to provide space between the plate setter and the pizza stone. I don’t do this because my grate is usually greasy and that transfers to the underside of the stone. 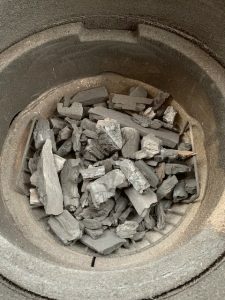 See the pictures below to see how to put everything together once you light the charcoal. At this point, you should light the fire in your Egg and get it going for a hot cook around 500 degrees Fahrenheit. When the charcoal is well lit, put the plate setter in and add the elevated pizza stone. I recommend using a laser thermometer for checking the temperature of the middle of the stone. Once you get it close to 500 degrees, then you’ll be ready to cook. 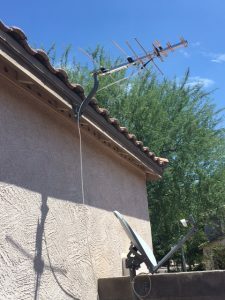 This process can take up to 30 minutes depending on how hot you get the fire. Pro tip: I highly recommend getting the grill and stone up to temperature before making your pizza because if the dough sits for too long, it will start to stick to everything! I recommend using a pizza peel or paddle when you create your pizza. Spread a nice layer of cornmeal out on the peel before getting the dough. The cornmeal will help when you are ready to transfer the pizza to the hot grill. You can also use parchment paper, but you need to remember to remove the parchment paper out about halfway into the cook. If you leave the paper on the grill, it will burn and become brittle. Grab a ball of the dough you created earlier and begin to spread it out on the peel. Add more cornmeal to the peel if the dough begins to stick. 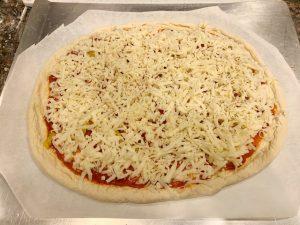 Once you’ve formed the dough, add your sauce and toppings. In my opinion, every good pizza needs pepperoni! Make sure to add lots of cheese; it will melt beautifully and take on a smokey flavor. 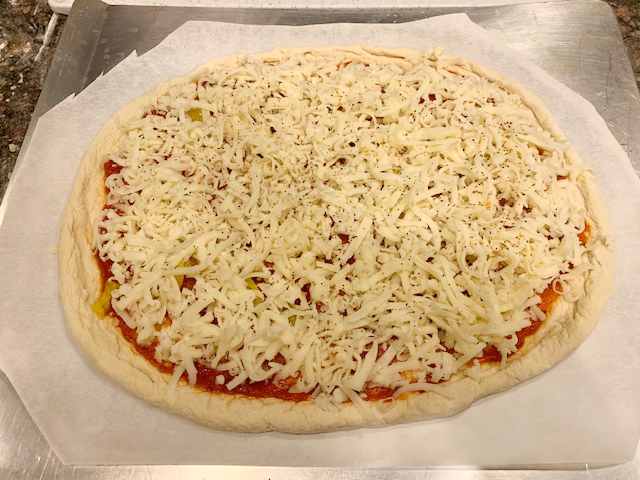 Pepperoni and Banana Pepper pizza ready for the grill! 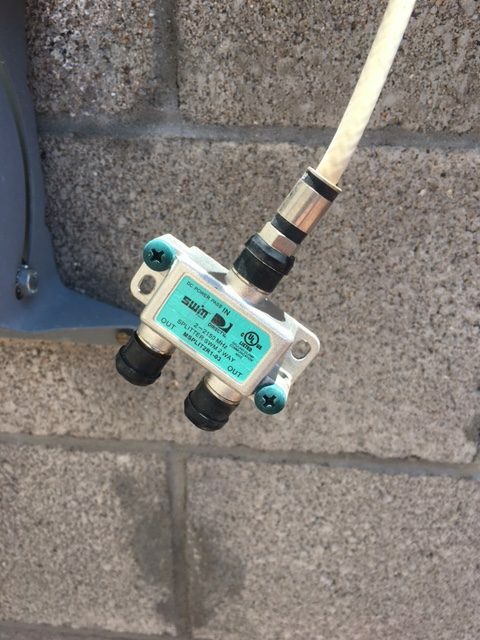 Now we’re finally ready to put the pizza on the grill! At this point, you’re on your own. If you put enough cornmeal on the peel, your pizza should slide off and onto the stone. If not, then you will need to provide an assist to the pizza and help it onto the stone. 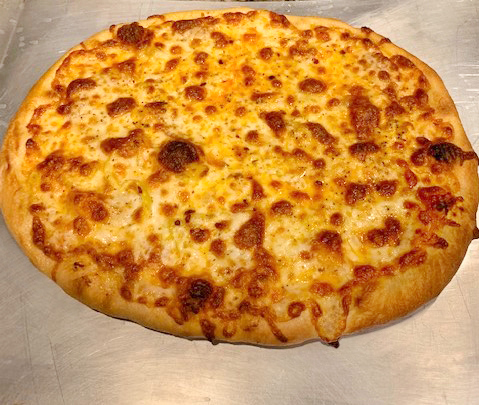 Putting the pizza on the stone is hard and takes practice so don’t get discouraged if you don’t get it the first time. Remember that if the dough gets caught, you can always fold it over into a calzone! I decided to cook this pizza using parchment paper. I was able to effortlessly slide the pizza onto the pizza stone. 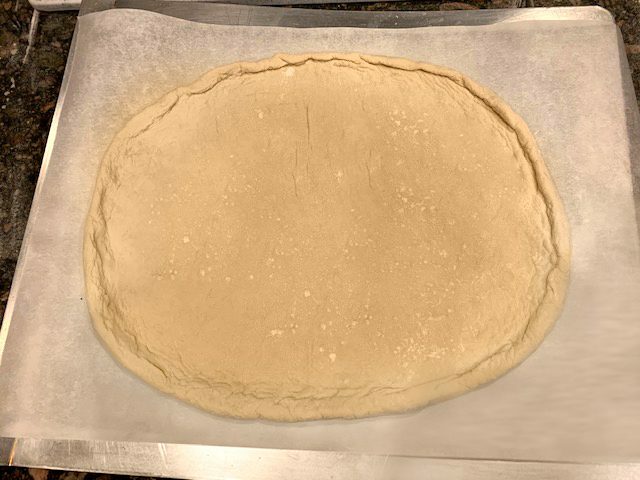 The most important thing to remember when doing a Big Green Egg pizza on parchment paper is to let the dough cook halfway and then slide the paper out from between the pizza and the stone. What is the time and temperature for pizza? Cook for 10 minutes at 500 degrees Fahrenheit. After 10 minutes, check the pizza for doneness. If you followed my recommendation above about getting the middle of the pizza stone to the temperature you should have a full cooked pizza. It is hard to say how long it will take to cook a pizza on your Egg because of the variations in temperature. Check the pizza minute by minute until you reach the desired doneness. I have experimented and gotten my grill up to 700 degrees. At that temperature, I only cooked my pizza for 8 minutes. Use your pizza peel to remove it from the grill. Let the pizza cool for a few minutes. Cut into pieces and enjoy. Congratulations on cooking a pizza on your Big Green Egg! 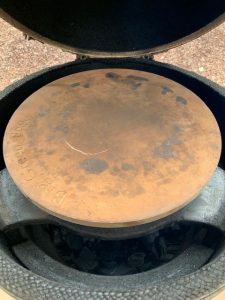 What is the best pizza stone for Big Green Egg? Buy the Big Green Egg brand pizza stone if you want the highest quality stone on the market today. 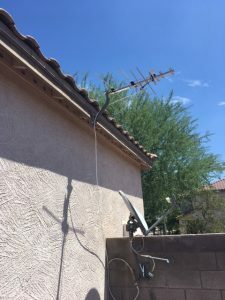 The stone is much thicker than most which allow it to retain and distribute heat throughout. I’ve baked bread and cookies on my stone in addition to pizza. There are other pizza stone options for use on a grill. How do you clean the pizza stone? Scrape off any excess food and wipe down with a paper towel. Do not use soap and water. A pizza stone is very porous, and the soap will soak into the stone and affect the flavor of your food. How to season the pizza stone? Over time as you cook more the stone, will season itself. A seasoned stone will allow for pizza to cook evenly in addition to sliding on and off easier. How long does it take to cook a pizza at 500 degrees? 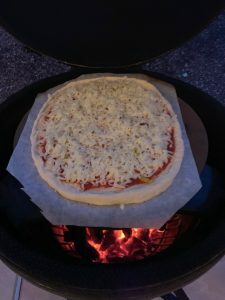 How to cook a Big Green Egg Pizza with parchment paper paper? Parchment paper helps you get the sticky and wet dough onto the grill. About half to 2/3rd of the way through the cook the dopugh should be cooked enough that you can carefully slide the parchment paper out between the crust and the pizza stone.